Don't be fooled, hoomin. I don't monkey around with disapproval! 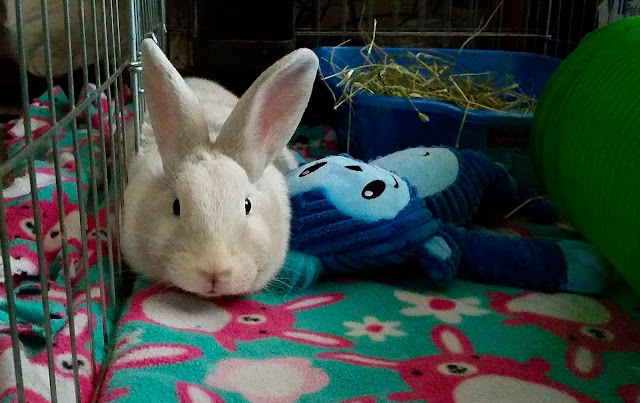 Number 1 is a survivor of a house fire at her foster hoomins, along with 7 other bunnehs. Angela says "(...) so far, (she's) the least disapproving bun out of them all. She likes to hang out with Monkey and keep him company. She is actually still up for adoption. She was adopted out, went out and got spayed, and the family never came and claimed her. We've contacted the family via certified mail, phone calls, text messages, everything. The foster mom is now looking for placement of her. We are just happy she is one of the fire survivors. Such a sweet and good girl!" PS: We'll feature the other survivors and their stories over the next few days. Uhhh, Angela, we are going to need some more details here. For instance, did she start the fire? Oh, it doesn't matter. She's a tough talking little beauty. Thank you for taking care of the bunnies. Such a lot to go through for such a tiny furry girl! Have you tried to get their story on your local news? "Celebrity" strays seem to bring out the best in people. A white bunny with a story, a monkey, and a wonderful "fleecie" all in one package - get on it folks - this won't last! Hi guys, we have thought about making #1 famous and getting her out there and adopted. Due to the nature of the fire, there is an investigation. A family member started the fire.They lost 5 rabbits the night of the fire and one the next morning due to stress and smoke inhalation. Some were unrecognizable during the fire. They also lost their birds and their medical needs cat. Their dogs were also badly burned during the fire. Aunt Jane, it is all good. Your comment was cute and funny. We have been helping the family with bunnies, getting them dog food and piggie (guinea pigs) food and what not. They've had it rough the past month. I can only image how scared the babies were in the fire. Two of the bunnies only survived a fire burning around them by sitting in peed on hay in their liter box. The liter box melted around them. Took over a week to get them to use their liter box again. We joked that they were sitting on their lucky rabbit feet. So, we've joked about the fire as well. Thank you. Is their anything we can do to help? ... we'll make a post with the gofundme link too.